Mani Rimdu Festival is celebrated at Tengboche, Thame and Chiwong Monasteries of Solukhumbu Nepal. This is a sacred ceremonies and series of events of empowerment. It is a sequence of nineteen days celebration, which concludes with three days public festival. Sherpa get time to gather and celebrate this festival with monastic community. 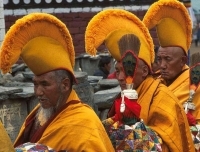 Lamas and Sherpa gather at the monastery for five days for the welfare of the world. Demons are quelled and the virtuous are rewarded. 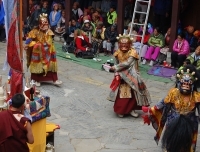 The monks wear elaborate mask, costumes’ and through a series ritualistic Lama dances, dramatize the triumph of Buddhism over Bon, The main first days of festival involves prayers, second day for colorful lama dancing, they wear brocade gown and wonderfully painted papier-mâché masks. Last day is for some humorous dances and chanting prayers. Hundred of local people and foreign tourist attend the performance. 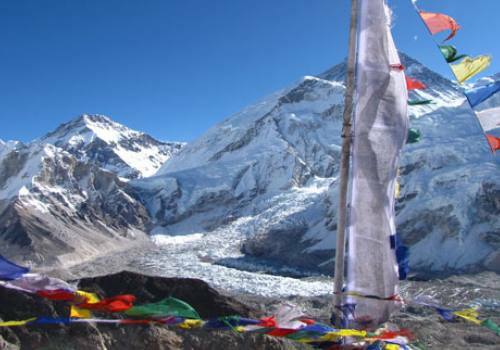 This trek rewards you to see the real and ideal culture of Sherpa people and great Himalayan picturesque views. The date of the Mani Rimdu festival is fixed according to the Tibetan Lunar calendar. The head lama at the Tyangboche Monastery announces the dates. 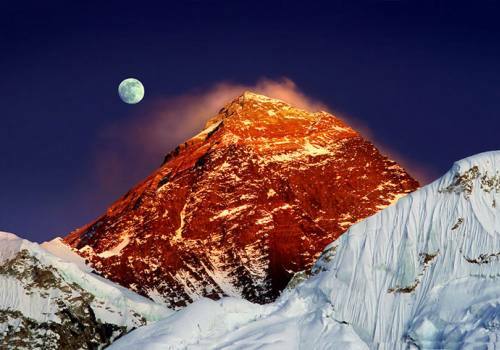 In Tengboche the Mani Rimdu is performed in the 9th Tibetan month which usually falls in October or November full-moon. Mani Rimdu Festival date for the year 2019 is celebrating on 12th, 13th and 14th November 2019. The Dakini dance is performed genially. Slow motion dance steps, keeping perfect time with the soft tinkle and slow beat of bells and drums is performed by five young priests. 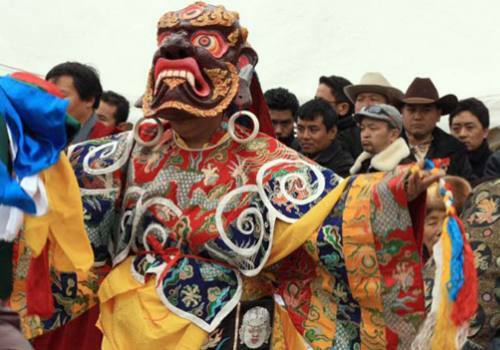 The dancers are without masks, and portray female spiritual figures; the partners of Padmasambhava. It is believed that they come from his pure land of Shangdok Palri where they live within his mandala. They herald the imminent arrival of Guru Rinpochhe at the Mani Rimdu.Two of the Ghing are male, and carry cymbals, while the two females carry drums. The males represent skillful means and the female represent wisdom; these two aspects of the path The torma is made from barley flour and decorated with colored butter. It begins by symbolizing the body of the deity, and by the end of the ceremony, symbolizes enlightenment itself. It stands in the front of the mandala on its own shrine, at the very heart of the temple. 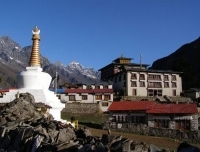 Alternative Mani Rimdu Festival Trek to Chiwong Monastery in lower Everest. 05 Nov: Drive to Dhap (2850m), 7-8 hrs drive. 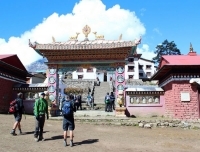 06 Nov: Trek to Ghunsa (2250m) via Dorpu,5-6 hrs trek. 07 Nov: Trek to Pattale (2840m) via Kerung, 5-6 hrs trek. 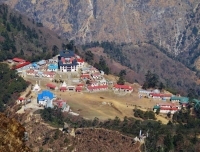 08 Nov: Trek to Jhapre (2820m), 5-6 hrs trek. 09 Nov: Trek to Pikey peak (4065m.) 5-6 hrs trek. 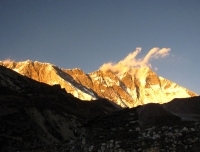 11 Nov: Trek from Junbesi to Phaplu (2380m). From Kathmandu, take an exciting flight of 35 minutes to Lukla; a beautiful mountain town at the altitude of 2800 meters from sea level. The flight rewards with beautiful views of landscape and snow capped mountains. Upon landing at Lukla, meet our support staffs and start our journey to Ghat. Stay overnight in lodge. After having breakfast at Ghat; we set off the today for Namche Bazaar. Hike to Namche Bazaar through beautiful valley along Dudhkosi River takes 5-7 hours walk from Ghat. First 4-5 hours will be easy regular trail and at the end of the hours we cross the region highest beautiful suspension bridge over Dudhkosi and start a demanding uphill to Namche Bazar. Stay overnight in lodge. Rest day to acclimatize our body and to avoid Altitude Mountain Sickness further up the trail. 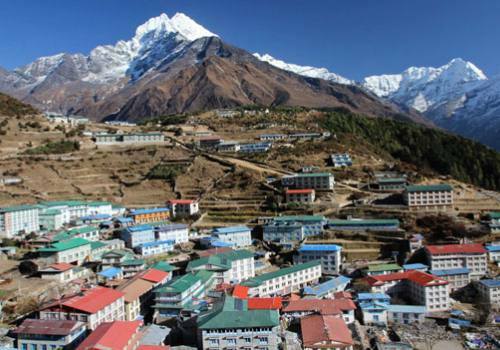 We can hike up to Everest View Hotel for panorama, explore Sherpa villages above Namche and visit Sherpa museum or hang around at Namche Bazar. There are many hotels, lodges, restaurants, Irish Bar, Gear shops, barbar shop and groceries etc. The people called it down capital as all the people wear down jacket in cold season. Day 04:Trek to Tengboche (3870m), 5-6 Hours Hike. 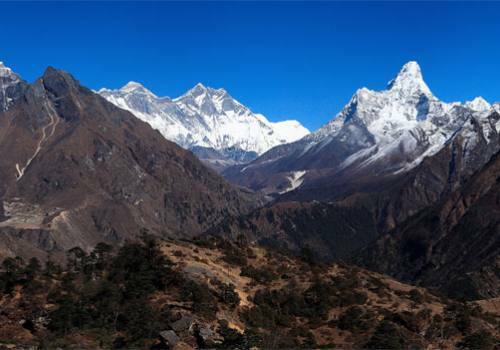 We trek to Tengboche today that is situated at the elevation of 3870 meter / 12694 ft from the sea level. This is the highest elevation you will sleep for 3 nights. 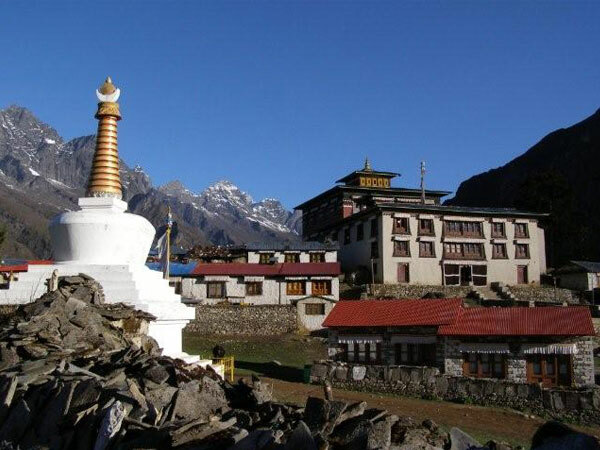 From Namche to Tengboche; it takes some 5-6 hours walk to the region’s most active Buddhist Tengboche Monastery. We guarantee for fabulous Mountain View. Stay overnight in Lodge. Day 05: Attend the Mani Rimdu Festival. Stay overnight at lodge. Day 06:Attend the Mani Rimdu Festival. Stay overnight at lodge. Day 07: Trek to Namche (3440m), 5-6 hours walk. Stay overnight at lodge. 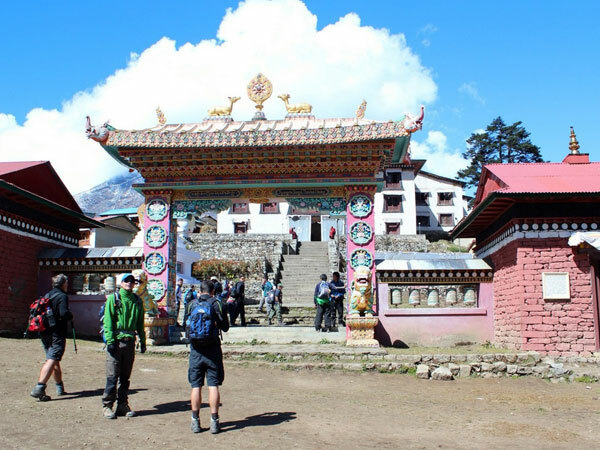 Day 08:Trek to Lukla/2800m 2/3 hours walk. Stay overnight at lodge. We retrace back to Namche from Tengboche and it takes 5 hours. On the way back now you could enjoy the bar and drinks as we are combing back. Alcohol is not recommenced above 3500 meter while going up. Day 09: Fly back to Kathmandu at around 8:30am. Shopping and relax. 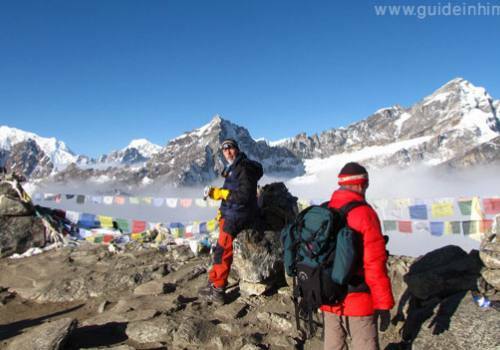 One licensed and experienced English speaking local trekking guide. An assistant guide to support the guests and porters as per group size. Daily meals: (8 Breakfasts, 8 Lunches and 8 Dinners during the trek. All necessary permits for Mani Rimdu Festival Trekking. International airport transfers. W can arrange if you ask us. Guided tour and monuments entrance fees in Kathmandu, we arrange on your request. 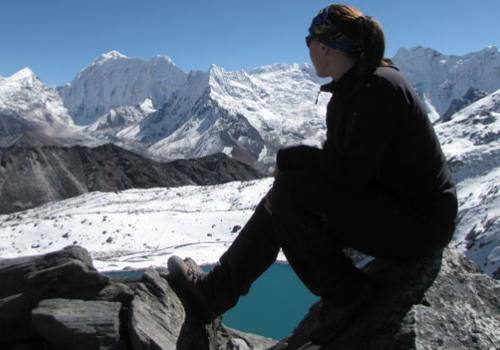 Personal travel insurance, international air ticket and Nepal visa fee. 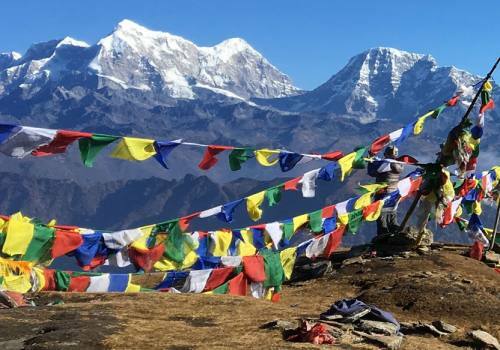 A Short Note: The trip price will be according to Deluxe, Standard, Budget and group size and many people combine this trek with legendary Everest Base Camp Trek and Everest Three High Passes Trek so please kindly provide us your details for your customized tour package.